Considered by many to be the world's greatest bounty hunter, Duane 'Dog' Chapman has become famous for capturing fugitives on Dog the Bounty Hunter, his number-one-rated show on A&E. But his job doesn't end when he cuffs his man-or woman. Having personally struggled against abuse, addiction, and a life of crime, Dog knows a thing or two about the path that these fugitives cuffed in the back of his car are on-and he has a good idea of the bad news they'll find at the end of it. As someone who has succeeded in beating the odds and finding a way to live on the right side of the law, Dog also knows what the person in the backseat needs to hear in order to straighten out his or her life. This is your wake up call. You either answer it now, or pay for it later and for the rest of your life. You're being given another shot at things, but only if you take the risk to make the right decision. The choice is yours. What's it going to be, brotha? While he is himself a mentor to many, Dog draws strength from the great teachers in his own life to face the surprising and difficult challenges that have come his way. Through hard work, unflinching faith, and the acknowledgment of his own flaws-along with the overwhelming desire to fix those flaws-Dog has been through the fire again and again, and come out the stronger for it. 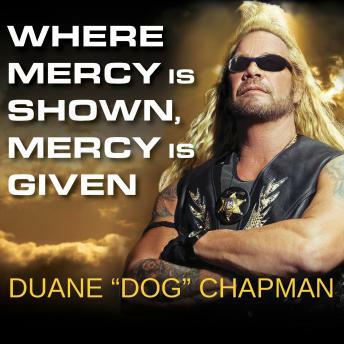 Revealing, behind-the-scenes looks at Dog's most significant challenges, along with seat-of-your-pants accounts of his most breakneck bounty hunting stories, makes Where Mercy Is Shown, Mercy Is Given a must-listen for any fan.